The popular Byron Lighthouse Run celebrates more than 10 years of races in 2015, with the 10km race and 6.7km walk taking place on 18 October. Whether this is the first time you’re running the race or it is an annual event on your running calendar, the Byron Lighthouse Run presents a fun run around some of the area highlights, including the Byron Bay Lighthouse, perfect for someone on holiday who enjoys running. Hopefully you’ve already registered and took advantage of the early bird registration discount, but if not, there’s still plenty of time to nab a spot in the race. You can register up until 15 October. Entry is just $45 ($40 if part of a team of five) and $20 if under 17 years of age. Registration is accepted on the day of the Byron Bay Lighthouse Run/Walk, but the cost of entry at that point is $70 so best to get in ahead of time. This year the race also features a Kids Dash 1K event, which is for all children under 12 and will start at 9 am. It is not timed and every participant will receive a medal for finishing. Entry fee is $7 until 15 October ($10 day of the event). The race continues to get bigger and better on an annual basis with organisers hoping to hit a total of 100,000 participants over the history of the race this year. There is a competitive element but most of the runners are doing it for fun. The charity event benefits different recipients each year, and in 2015 the event will give all the proceeds to the Lismore Base Hospital, which will use them purchase a CADStream software for better diagnosis of liver, prostate and breast cancers. Local businesses all chip in with prizes and this year’s main sponsor is Brookfarm, which appropriately enough manufactures healthy foods using home grown macadamia nuts. Fitness trainer Lisa Parkes, an orgnanizer of the Byron Bay event and a personal trainer, says you should already have been doing a bit of hill running seeing as the Lighthouse Run course has quite a few of them! If you have already been doing this, then your running style should be more of a bounce with plenty of high knee lifting movements (which is the best style for the Byron Bay course). If you haven’t done any hill running to date then now is definitely the time to rectify that and get started. According to Parkes, hill running doesn’t just allow participants in the Byron Lighthouse Run to get familiar with the style of course, but it also builds power into the calves, allowing the runner to spring forward faster. In fact hill running makes the calves two to three stronger than simply running on the flat. The bouncing action of hill running also builds up the front thighs (particularly the quads). 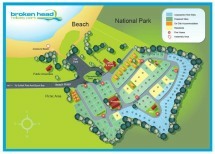 Broken Head Holiday Park is an excellent choice for a place to stay over your holiday. We’re conveniently located for the event, but far enough away that you won’t have to worry about the crowds and can spend time relaxing after your run or walk. Check out our beach cabins and beach shacks as an option to provide everything you need for a relaxing holiday stay if you don’t want to pack up the camping equipment this time around. Consider making your stay longer so you can soak up the Byron Bay area while you’re here, check out our blog posts for activity ideas!